Today is not too hot, not too humid, just pleasant enough to stroll along the lake shore and savour the sight of calm waters upon which swans look on to the sailing boats. A perfect summer day! This sight made me think of the "eternal" Mediterranean, a universe into itself that is both the cradle of our civilization and a vast patrimony of humanity. 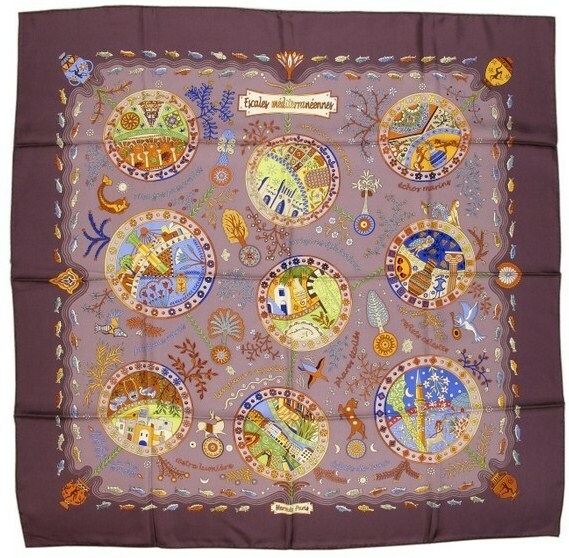 Created by Christine Henry and issued in 2003, "Escales Mediterranéennes" ("Mediterranean Stopovers") is a tribute to the element that has defined civilizations - a Sea that has become at once a mosaic of colours, cultures and spirituality. The three monotheistic religions developed around its waters. Its shores saw the "inventions" of numbers, arithmetic, astronomy... in effect, of all science. Here is where the great myths were born, such as the story of Atlantis, the island lost under the sea, or that of the sirens who attempted to inveigle Ulysses (the most famous hero of Antiquity) and who threw themselves into the sea and drowned. So many tales have been recounted, in fact, that even the ancient Library of Alexandria (or its modern sister) could not boast enough shelf space to house them all. Just to get an idea of how variegated the Mediterranean cultures are, consider only how its ever-changing colour made it so difficult to reach consensus and proved equally fascinating to mankind. The Sea is sparkling and pink at daybreak, azure in the mid-day heat, a cloudy emerald hue near the rocky coastline, golden as the sun sets, gray or midnight black when beset by inclement weather and white foam-lashed with shades of silver when the wind whips it into a fervour. And no sooner have we defined the colour of its waters than its mood changes and shifts to yet another place along the visible spectrum. This post invites you to plunge head-on into this imaginary voyage, where symbols of the Roman, Greek, Turkish, Spanish and Arabic cultures are gracefully depicted among the sea's natural treasure - fish and aquatic plants. This intermingling of elements is a close reflection of what a real explorer would be set to discover: vestiges of the Roman world in Libya, prehistory in Sardinia, Greek cities in Sicily, the Arab presence in Spain, Turkish Islam in Yugoslavia ...a diversity born out of commerce and wards. The scarf is superb and ageless - both when displayed and when tied - thanks to the designer's painstaking rendition of the details of each graphic element and to Hermes for the magnificent colour combinations. Having been married to an Armenian from Lebanon I thoroughly enjoyed your evocation of the hues of the Mediterranean. 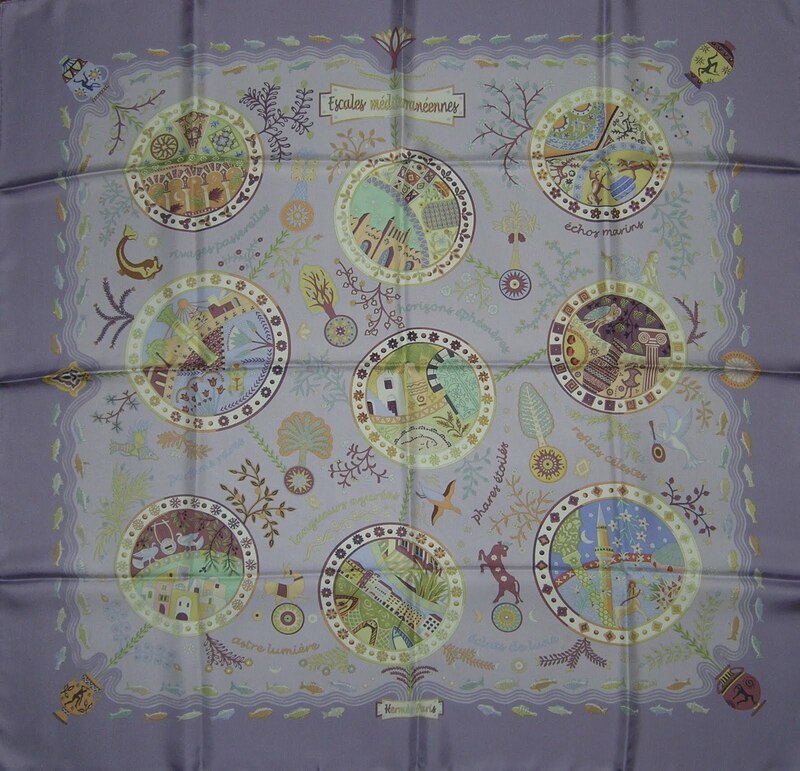 I will look at this scarf with new eyes... thanks! Thank you Gianna and Nata, very kind of you both. Nothing like the sight of the Mediterranean to make you feel you're catching glimpses of the eternity.